We will not wait for the appointments of the rulers – we will set our own agenda. Even if it will be 2015 before the ECB holds its hors d’oeurve event of prominent faces to inaugurate its new tower, Blockupy will be in Frankfurt this fall. Now, after the “May of Solidarity” across Europe and before the blockade of the ECB inauguration next year, is the right time: we will discuss, we will bring together our struggles and make plans. We will meet to music, with a beer, at a film. And, of course, we will be present in those places where we disrupt normal activities: on the streets, over the fence. Democracy comes from our many struggles. 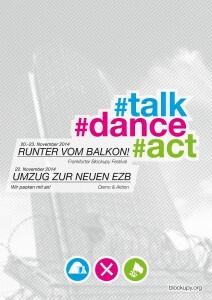 Blockupy attempts, together with others, to create a platform in Europe at a slow moment – against austerity and exploitation, for solidarity beyond borders. Europe is not a question of passport or origins for Blockupy – Europe is the region in which we are starting to struggle together. We are expressing a collective refusal of all nationalist, sexist and racist “crisis solutions”. #talk – and listen/what to do. Together in workshops, podium discussions and assemblies we want to ask questions that we can answer in collective action: how do we find the cracks in the capitalist cement? How do we guarantee an unconditional welcome to all refugees and migrations? How do we take back our cities, which are selling themselves? How can we find each other so as to live and work with dignity? We will talk about what we must do, what we want to do, to develop alternatives, to bring our struggles together and become stronger. #dance – grooves and resonances. The festival will bring a different light to many places in the city – spaces of self-managed culture, projects of other ways of living and taking residence, pubs and cafes, theatre, cinema or bookshops. We will met, listen, confuse and explain. We will dance, eavesdrop and be in the squares. A sustainable politics of protest cannot abstain from bringing disorder and confusion to the ruling order. #act – beyond borders. Factually and symbolically, collectively and publicly we will go beyond borders. We will find places that stand for policies of impoverishment. We are convinced that mass disobedience is a very appropriate answer to the scandal of the becoming-normal of the ‘crisis policies’ and ‘reform’ of European capitalism. Even as a dress rehearsal: so that we can more clearly imagine the days and nights of the ECB blockade in 2015 and break through the ‘expected’. We should all meet in November!